Leadership Resources' experience proves an integrated approach is required in order to increase profit and truly achieve an organization’s vision. When integrated, the unique combination of strategy, development and accountability deliver the substantial results growing organizations desire. Leadership is a learned and continuous behavior. When a company invests in talented leaders, the investment provides great reward for decades to come, not only with that leader, but also with their direct reports and future direct reports. In a service economy, many organizations find that payroll is their largest expense. Investing in the development of an organization’s leaders is an ideal way to ensure the best use of that expense. Growth is desirable, but at times can appear difficult and overwhelming. Our strategic planning services help you achieve a consistent operating system for your organization, while guiding you through the growth spurts smoothly, so you can seize every possible opportunity. Our services also help organizations and leaders identify their highest payoff activities to maximize productivity and become laser-focused on success. Healthy organizations practice day-to-day accountability, which then leads to increased productivity. For a company to be successful, accountability must be part of the culture. Our services develop the leadership skills required to ultimately drive accountability and productivity throughout the organization. Culture isn’t just a buzzword. It has a huge impact on both your staff and customers. A healthy culture is the backbone of a productive organization, and day-to-day accountability must be built into the very DNA of an organization. 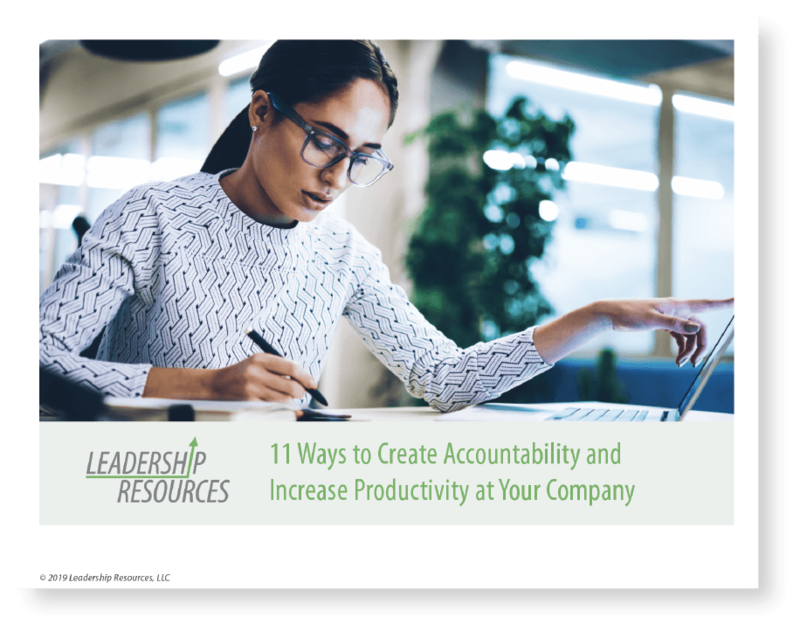 Clients work with Leadership Resources in order to develop high-performing leaders and create a culture of accountability. While many business consultants offer general business consulting guidance services for organizations, we specialize in leadership development, strategic planning, and the Entrepreneurial Operating System (EOS®). Clients select Leadership Resources because of our highly integrated approach. With great leadership, a sales team can really shine. We’ll show you how to improve the key factors in sales performance. We help sales professionals of all levels experience increased results, amplified confidence, and improved client communication. Your company needs a purposeful plan for hiring great leaders, including people who are a strong cultural fit with your team and can be developed into great leaders. Through our strategic planning processes, we help organizations develop a leadership plan, so that before every hire, HR staff and department managers consult that plan and understand what kind of person they need to hire. Learn eleven secrets for driving your company toward its vision.